And while this may sound like a trivial distinction, it's actually more meaningful than it may first appear. The tight schedules in the smartphone industry mean that time is often the most valuable asset a manufacturer can have. 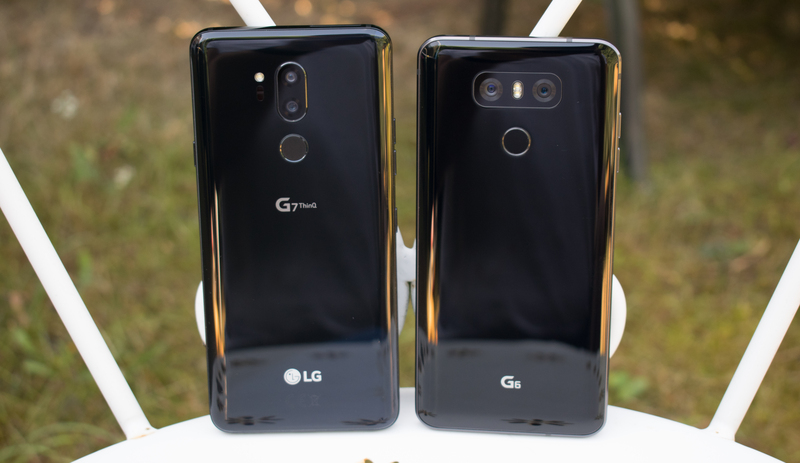 In this case, scheduling the G7 for a bit later in the year gave LG an opportunity to try to raise its build-quality and to offer a well-rounded smartphone, in order to produce a more viable competitor to the fierce competition that are the other flagship handsets. The biggest impact of this shift comes in the form of the SoC – the heart of the phone. Unlike last year's LG G6, where LG opted to use a prior generation SoC, for this year, the G7 avoids such a compromise. Instead LG is packing the phone with the latest internals, and at least on paper, it looks to be a competitive offering for 2018. LG’s been in a relatively rough spot in the last couple of years, as we’ve seen the company stumble in terms of product execution. The LG G4 suffered from performance and battery issues due the Snapdragon 808/810 issues for that generation. The G5 promised great innovation through its modular design, however this again didn’t exactly pan out in terms of commercial success, mostly due to the phone’s weaknesses such as the display as well as a compromise in build quality due to the modular design. The G6 overall was probably LG’s most solid phone over the last few years and it didn’t have any deal-breaking issues, other than it being a S821 device in a year of S835 alternatives. 2017 has been probably the year where the V-series actually seemingly has outshined the G-series as LG’s top-tier flagship line. 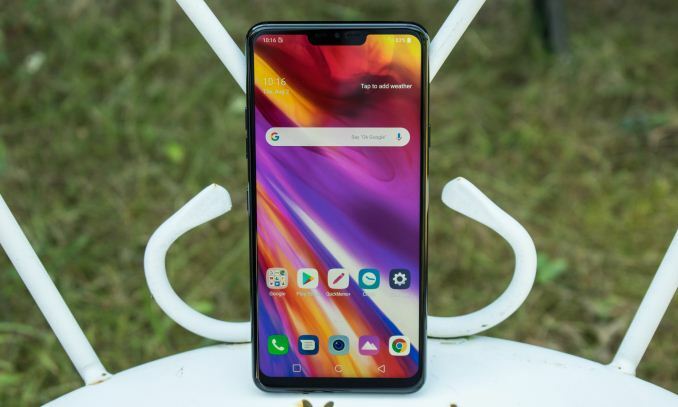 The V30 has been an excellent device, however I’ve been abstaining recommendations of phone due to the fact that my review unit had really bad uniformity issues, as well as bad low-brightness picture quality on the display. Newer units we've been sampled have offered better uniformity, but both were still not quite as perfect as you'd find from Samsung alternatives. Least to say, having to play the display lottery is not something that should be happening at these price-points. 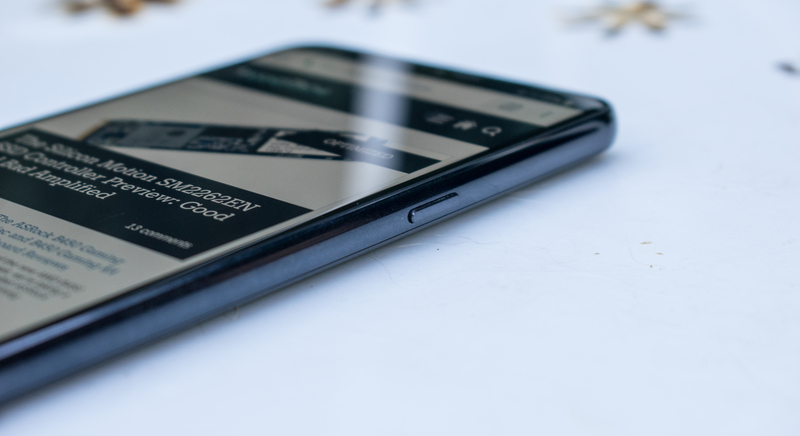 The G7 promises a lot in terms of specifications, but most importantly for LG, what the phone needs to deliver is an increase in the overall product quality as well as more attention to detail. In terms of the hardware, the G7 is a large upgrade over the G6 as it represents a two-generation jump in the SoC, switching from the Snapdragon 821 to a Snapdragon 845. Performance wise we should see excellent results from the G7, as most other Snapdragon 845 devices this year have just been fantastic products. The phone comes with 4GB of main memory as well as 64GB of UFS 2.1 storage, with the option of a microSD slot for expandable storage. In terms of device footprint, LG actually managed to match the width and thickness of the G6 – although the industrial design has changed. The new G7 ergonomically feels like a smaller phone thanks to its more rounded edges. Where the G7 differs from the G6 in terms of dimensions is the height: it adds 4.3mm on to the top of the phone. The new format houses a longer 19.5:9 aspect-ratio screen which comes with a top display notch. 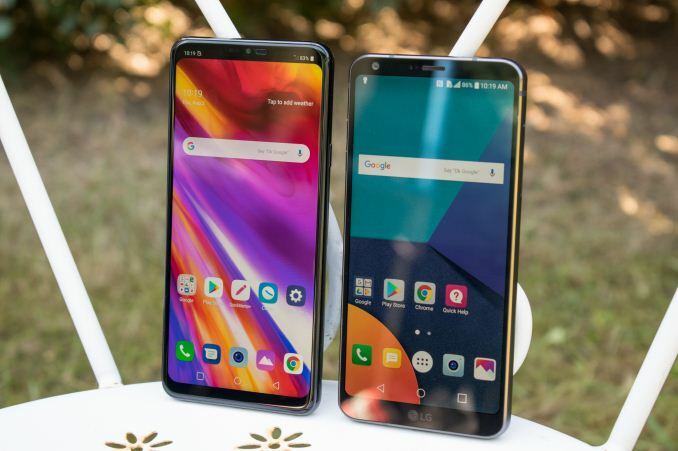 Although the device is longer, its top and bottom bezels have seen a reduction compared to the G6 so the overall display-to-body ratio has increased. A non-visible change in terms of the internals is that the battery size has actually decreased from 3300mAh down to 3000mAh – it’s possible that LG had to do this to be able to integrate the new speaker design. Overall though this doesn’t concern me too much as the efficient SoC and promised screen efficiency should still result in good battery life. The display saw a lot of fanfare as the 3120x1440 resolution unit is of a new RGBW "M+" subpixel layout technology which promises great strides in terms of display power and power efficiency. The back of the phone we continue to see a glass cover, and it comes with all the usually associated advantages, such as wireless charging and an IP68 rating. The camera housing has seen a redesign as the horizontal dual-camera layout in the G6 and V30 has been replaced for a smaller and tighter vertical setup. The G7’s camera hardware hasn’t changed much from the V30’s – the main camera is still a 1/3.09" 16MP Sony IMX351 with 1µm pixels and a lens with a large f/1.6 aperture. The wide-angle module however has seen larger changes as it sees a resolution bump from though a sensor upgrade, this time around using the same sensor as the main camera. Also notable is that the wide-angle view has been reduced from 120° down to 107° - still offering a wide angle experience but reducing the fish-eye perspective and also improving image quality by reducing chromatic aberrations on the outer portions of the image. LG jumps on the display notch bandwagon; the official name for the G7's notch is “new second screen”. In practical terms it doesn’t differ much from what we’ve seen with other vendors. LG also offers different options to customise the area – going from various more artistic background options to the option of just blacking out the notch. For an LCD screen the G7 actually really surprised me as the display offered sufficiently high contrast ratio that blacking out the notch worked basically *almost* well as an OLED screen – however it was still visible in some bright scenarios. On the bottom of the phone we find the speaker grill with 3 large holes. LG has made big promises on the speaker improvements as it uses the whole internal space of the phone as a resonance chamber, promising louder and better audio. Objectively measuring this was one of the reasons I’ve (re)introduced speaker evaluation into recent reviews so we’ll later in the article how LG’s efforts panned out. 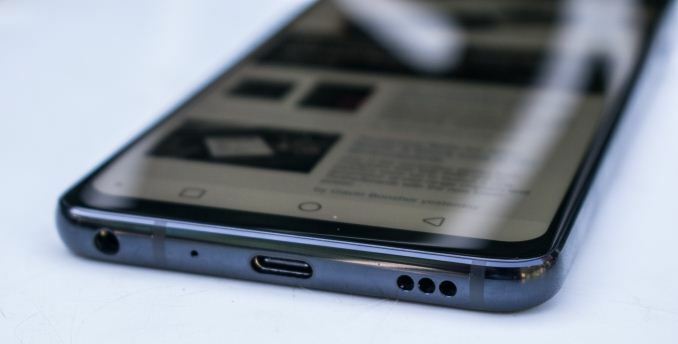 There’s a USB-C port, a microphone and a 3.5mm headphone jack. LG still caters to audiophile crowd and the G7 integrates a ESS Technology ES9218P audio SoC which is stated to be able to have enough capabilities and power to drive even the most demanding high-impedance headphones with up to a 2Vrms output voltage. I measured this and unfortunately the G7 doesn't quite reach the promised levels as it is only capable of 0.764Vrms without the Quad-DAC and 1.030Vrms with the Quad-DAC enabled. Distortion wise however the G7 performed excellently - I'm working on re-building a proper audio measurement methodology for the future. On the right side of the phone we find a lone power button. LG’s past flagships had the power button integrated on the back on the fingerprint sensor, while this was “okey” in terms of ergonomics I still think a side-power button does a better job so LG going back to the more traditional placement is a good thing in my book. The SIM and SD card tray has been now relocated to the top of the phone. On the left side we find the volume buttons, and a brand new assistant button. Instead of creating a new custom assistant, LG fully integrates Google Now. I found the button to have a massive usability issues in terms of actually listening to commands as there’s a notable delay between pressing the button and Google Now actually starting to listen to your queries. I found this annoying enough and such a bad integration that I think it kind of defeats the purpose of the button – for contrast and as an example, Samsung’s Bixby button will instantaneously start listening to a query as soon as you press the button and the app will catch up with responding.